Rolling Big Power believes in true customer satisfaction. We strive to provide you, our customer, with a delightful experience with our products. In the event that your experience is not delightful - please contact us and allow one of our professional customer service agents take care of you. Our primary goal is for you to become a customer for life - we're willing to earn it. NOTE: If you purchased an RBP product from an unauthorized reseller, the unauthorized reseller your warranty may or may not be honored. It is strongly recommended that you purchase RBP products from an RBP Authorized Resellers. To view dealers currently authorized to sell Rolling Big Power products, CLICK HERE. Rolling Big Power Grilles come with a Limited Lifetime Warranty against rust and corrosion on the finish. This warranty extends to the original purchaser for the product installed on the purchaser's original vehicle. Any RBP grille that includes an LED Light Bar includes a 2-Year Limited Warranty on the light bar assembly. Proof of purchase is required when submitting a warranty claim. NOTE: Custom finishes are not covered by warranty. This only applies to grilles manufactured and purchased AFTER 2016. Grilles manufactured and purchased prior to January 1, 2016 will come with varying warranties. Please email us for details. RBP Step Bars in our textured black finish come with a 3-Year Limited Warranty against rust, peeling, flaking or other manufacturing defects. This warranty extends to the original purchaser for the product installed on the purchaser's original vehicle. Proof of purchase is required when submitting a warranty claim. RBP Step Bars in our polished stainless steel finish come with a Limited Lifetime Warranty against rust and corrosion on the finish. NOTE: Custom finishes are not covered by warranty. This only applies to step bars manufactured and purchased AFTER 2016. 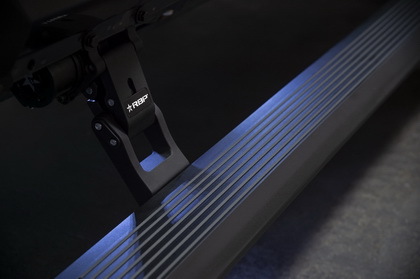 Step bars manufactured and purchased prior to January 1, 2016 will come with varying warranties. Please email us for details. RBP Exhaust Tips in our textured black finish, and polished stainless steel finishes come with a 2-Year Limited Warranty against rust, peeling, flaking or other manufacturing defects. This warranty extends to the original purchaser for the product installed on the purchaser's original vehicle. Proof of purchase is required when submitting a warranty claim. NOTE: Custom finishes are not covered by warranty. RBP Body Armor Fender Trim come with a Limited Lifetime Warranty against manufacturer's defects. This warranty extends to the original purchaser for the product installed on the purchaser's original vehicle. Proof of purchase is required when submitting a warranty claim. NOTE: Custom finishes are not covered by warranty. RBP Pro-Series Fenders and Rock Rails come with a 3-Year Limited Warranty against manufacturer's defects. This warranty extends to the original purchaser for the product installed on the purchaser's original vehicle. Proof of purchase is required when submitting a warranty claim. NOTE: Custom finishes are not covered by warranty. RBP Fuel Doors come with a 2-Year Limited Warranty against manufacturer's defects. This warranty extends to the original purchaser for the product installed on the purchaser's original vehicle. Proof of purchase is required when submitting a warranty claim. NOTE: Custom finishes are not covered by warranty. RBP Suspension Lift Kit Systems and Leveling Kits come with a Limited Lifetime Warranty against manufacturer's defects for the full life of the product. This warranty extends to the original purchaser for the product installed on the purchaser's original vehicle. Please see RBP shock warranty notes below. Proof of purchase is may be required when submitting a warranty claim. RBP's warranty coverage does not include opinions regarding ride fitment, design or comfort. Certain mechanical aspects of any suspension lift product may accelerate ordinary wear and tear of original equipment components. Installation of certain RBP products may void the vehicle's factory warranty as it pertains to certain covered components. It is the customer's responsibility to check with their local dealer for warranty coverage before installation of the lift or leveling kit. RBP will, at its sole discretion, repair or replace the failed component. Any and all costs of removal, installation, freight or incidental or consequential damages are excluded from this warranty. A consumer who chooses to modify their vehicle with another manufacturer's products, or any aftermarket products will assume all risk and responsibility for potential damages incurred as a result of their modifications. Parts subject to normal wear: bushings, bump stops, ball joints, tie rod ends and heim joints. Leaf or coil springs used without proper bump stops. Products shown with misuse, abuse or abrasion contact with other items. Damage caused as a result of not following recommendations or requirement called out in the installation manuals. FOX Racing Shocks as per Fox Factory, Inc's policy. Products used in applications other than listed in RBP's catalog. Discontinued products at RBP's discretion. RBP assumes no responsibility for any product improperly installed, altered, lack of or improper maintenance or improper use of our products. Grilles, Step Bars or other products manufactured and purchased after January 1, 2016. RBP warrants to the original purchaser that its shock and stabilizer cylinders are free from defects in material and workmanship for so long as they own the vehicle. Excluded from this warranty are the finish of the product and mounting bushings. Defects in material and workmanship do not include such things as dented cylinders or bent rods caused by obvious side impact, rust, worn or deformed bushings. A shock absorber is a wear item and over time will experience diminished damping resistance due to normal component wear. This is not a defect in material or workmanship and is therefore not warrantable. Shock oil seals are subject to wear over time, and use, therefore are not covered under warranty. However, leaking shock seals less than one year from date of purchase, free from contamination, damage, or abnormal seal wear due to misuse may be considered for warranty. Please refer to the packaging for stated RBP warranty. CONGRATULATIONS ON YOUR PURCHASE OF RBP WHEELS. 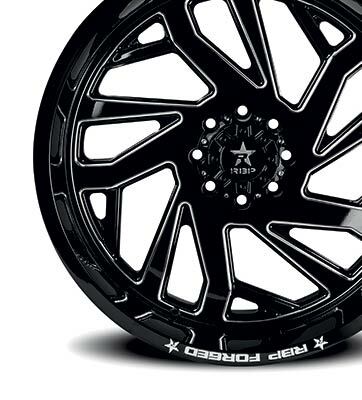 We are honored you have chosen RBP Wheels to personalize your truck. 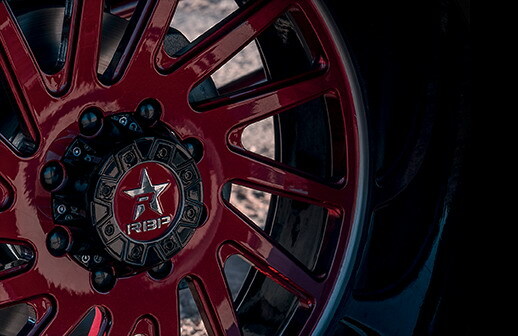 We at RBP go the extra mile to ensure our wheels maintain proper fit and finish as we explore new materials and coatings in order to provide you with unmatched vehicle integration and a presentation that lives up to your personal vision. RBP warrants to the first consumer purchaser that its wheels will be free from defects in materials and workmanship under normal and reasonable use for ONE year from date of purchase. RBP obligation under this Warranty is limited to the repair or, at RBP option, replacement without charge except for transportation, of any wheel which in RBP opinion is defective in material and/or workmanship. Wheels accessories that defective in material or workmanship will be repaired by shipping replacement parts to the original selling dealer or distributor for installation. Because of the delicate nature of custom finishes and paint, there is no warranty on custom finishes such as leather, wood, liquid carbon and color matched finishes. Any direct, malfunction or failure caused by damage to wheels in transit, off-highway use or by abuse, misuse, accident or negligence. This includes damage caused by potholes, curbs, or extreme heat. Wheels that have been altered, repaired, modified or have adapters or spacers. Wheels that have not been installed in accordance with RBP instructions or installed on incorrect tire sizes or used with excessive vehicle loads. Wheels that have been installed with other than RBP approved accessories such as lug nuts and valve stems. Wheels corrosion or cosmetic flaws occurring after purchase due to chemicals, caustic cleaning agents, climate conditions, road salt, or neglect. RBP wheels must be cleaned with soap and water only. Appearance defects in wheels that have been mounted after purchase or have been sold as blemished product. The fading or discolouring of gold accents accessories caused by exposure to caustic elements.